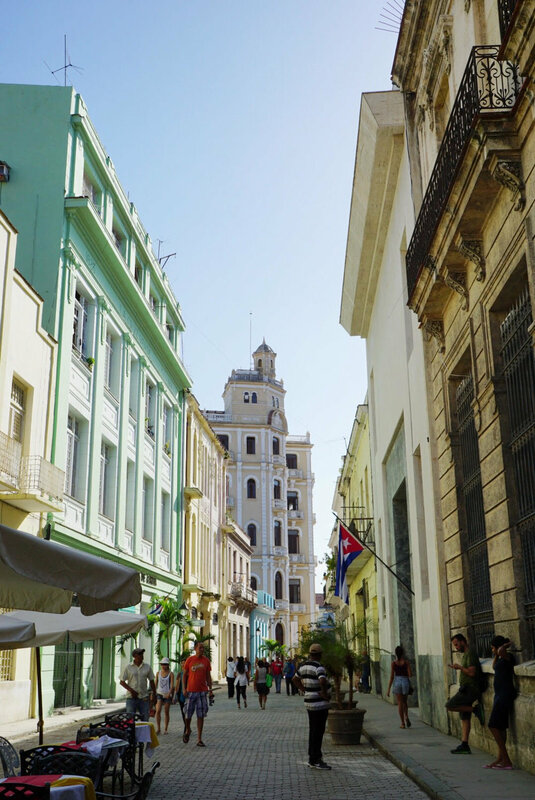 Habana Vieja [neighbourhood]: Take in dilapidated extravagance of the colonial architecture and spend a day walking around the old town of Havana (also known as Habana). Along the way you can snack on touristy yet delisicous street snacks, like caramel-filled churros and coconut ice cream served in the coconut shell (seriously, this is so, so legit). The main streets to walk down are Calle Mercaderes and Calle Obispo. Take a break in Plaza Vieja or Plaza de Armas and people watch both locals and tourists alike. Museo de la Revolucion [museum]: If you're a total n00b when it comes to Cuban history like myself, then make this one of the first stops on your trip. It gives you a run down from past to present on Fidel's revolution, and it's truly fascinating in a propaganda communist kind way. It's located between Habana Vieja and Centro Habana. Centro Habana [neighbourhood]: Centro Habana embodies everything I imagined before I traveled to Cuba. Crumbling colonial exteriors; old cars galore; unidentifiable smells (both good and bad); and locals living their every day lives. There's nothing much to see per se, but just stroll around and get a feel for things. The Malecón: This is the road running along the coast linking Habana Vieja, Centro Habana, and Vedado. From Habana Vieja to the main drag of Vedado if should take you around 30 minutes to a bit over an hour, depending on how often you stop to take pictures, etc. If you happen to come when there is a storm, you'll be able to see the waves crashing over the barriers which is actually great to just sit and watch (I sound like such an old person, but I swear it's totally worth it). Vedado [neighbourhood]: Havana's wealthier neighbourhood is the place for nightlife and eats. Most of the action occurs between the streets Calle 23 and Linea, but walking around the neighbourhood and just following your nose is the best way to go about it. Take in huge colonial mansions, many restored to their original glory. El Chanchullero [restaurant, bar]: Cuban food is on the whole, pretty average. But El Chanchulllero sets itself apart and serves up some amazing dishes and drinks. I got a mojito and one of their chicken dishes which were both amazingly fresh and tasty. The line can get kind of crazy in the evening, so try and avoid peak dinner time. Located in Havana Vieja. Heladería-Dulcería [ice cream, bakery]: Ice cream and bakery combined (WIN), for absolute pennies, especially if you're paying in CUP. Find it deep in Vedado on Calle 12 just north of the intersection with Calle 23. Other than the above, none of the other restaurant I went to in Havana were anything special. I recommend eating meals prepared by your casa hosts. Fábrica de Arte Cubano [art space, venue, bar]: How do you describe this place... It's like an art galley, bar, concert venue, and social mixer all mixed into one, with a strong splash of Cuban culture. Stroll the galley floors and discover hidden nooks, talk to other patrons, and sip on a Cuba Libre (cola, rum, and lime). I really loved this place. One very important thing to note: the line is OH SO BAD. We arrived at 9pm (it opens at 8pm) and waited in line 2.5 hours to get in. So get there early, maybe even before 8pm. Hotel Nacional [bar]: If you're any sort of celebrity or diplomat visiting Havana (I assume many read my blog...) you're most likely going to be staying at Hotel Nacional. But I'm not including it for it's accommodation, but for it's mojitos and view over Havana. Pay the exorbitant price of 5 CUC for a drink (by Cuba standards) and sit outside with a view over the Malecón and Havana neighbourhoods. Located in Vedado. Truthfully, I don't have a good recommendation for a place to stay. The first hostel I stayed in was infested with roaches (like they were in the bed with me...) and the second was just pretty blah. My suggestion is to go on Airbnb and book a casa particular based on reviews. If you're new to Airbnb, it's super trustworthy and you can get $35 credit if you use my link. I stay in both Centro Habana and Vedado, and both have their pros and cons. I would recommend Centro Habana if you're looking to experience true Cuban culture and life, and aren't afraid of that rough-around-the-edges feel (keep in mind, Cuba is completely safe, even if it doesn't look it). It's also centrally located and you can walk to both Habana Vieja and Vedado in less than 30 minutes. I would recommend Vedado for people looking for something a little more polished -- but a little less centrally located. I walked around most of Havana, but below I've outlined some of the other ways you can get from point A to B. Getting to and from the airport: Taxi is the best way (there is no direct public transport) and should cost you 25 CUC for the whole taxi. If you barter, you may be able to get it for less (since I was solo, I got mine for 20 CUC). Taxi collectivo: These are the classic old cars which are used as taxis. Sometimes they're shared with other riders, and sometimes you can rent them privately as you would a regular yellow taxi. Always agree on a price before you get in the taxi! And make sure you get a price estimate from your casa host so you know what the going price is. Yellow taxi: These are actually more expensive than taxi collectivos, so avoid if possible. Always agree on a rate before you get in. Coco taxis: I'm not sure if this is their official name, but they're the coconut-shaped taxis that you'll see zipping around the city. They seat a max. of 3 people, and are usually pretty affordable once you barter a good price. Bici-taxi: Bike taxis that only opperate in Centro Habana. They should only cost 1-2 CUC per trip. Check out the guides for Trinidad and Vinales, too!